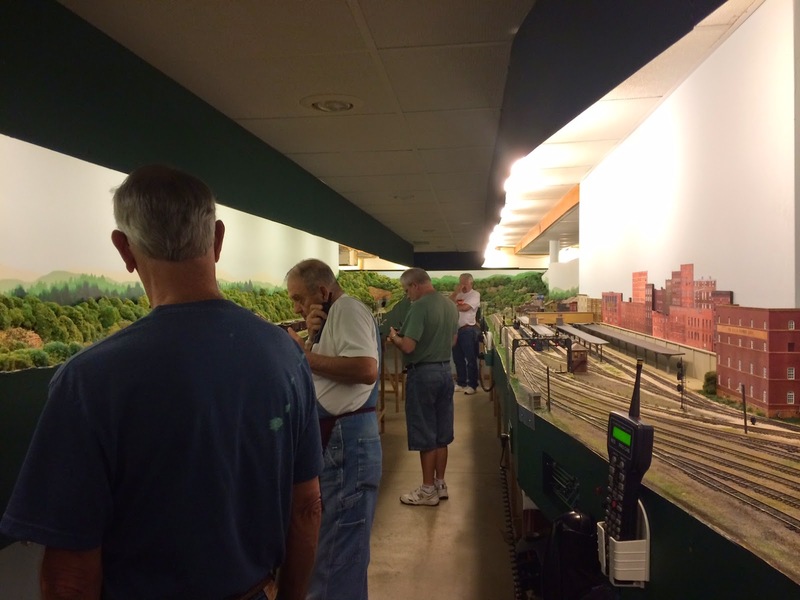 On Saturday, Bill "Smokey" Doll hosted an operating session on his beautiful Forest Park Southern layout. 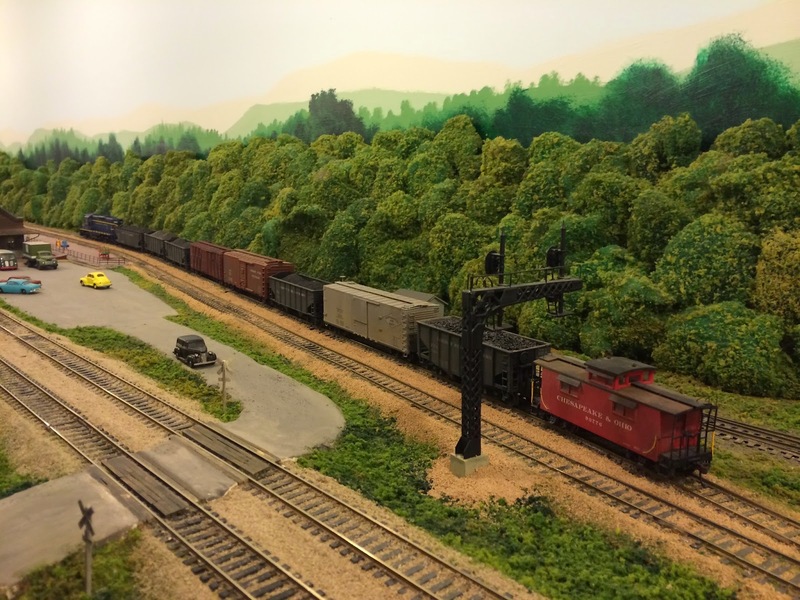 The layout was featured in Model Railroader last fall and can be seen here on Trainmasters TV: http://trainmasters.tv/videos/2014-05-2-tmtv-may-2014-edition-act-ii. Coming up the driveway, we knew we were in the right place. Anthony Hardy brought this old sign along and placed it where everyone would see it. Works much better than having an actual street address. And while you can't read the belt buckle in the photo, you know what's written on it- SMOKEY. 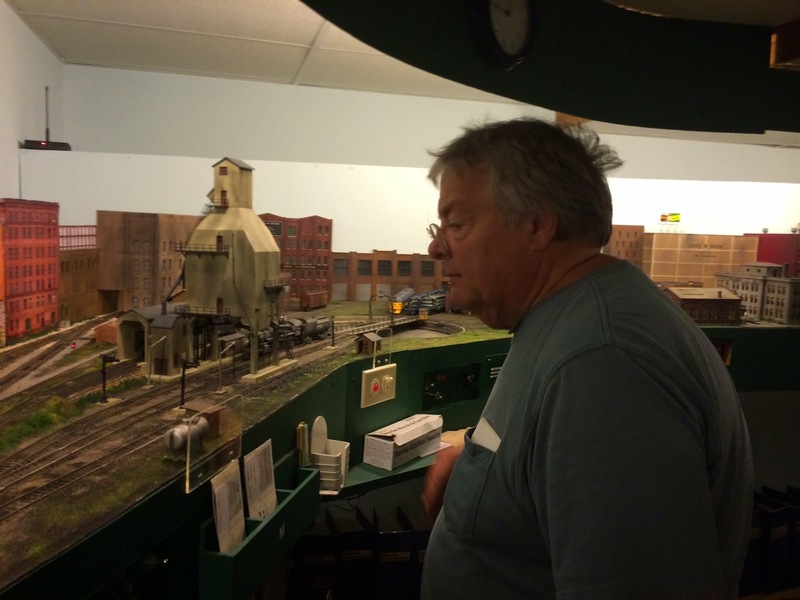 In the shot below, the Train Master has entered the room, complete with his rock star t-shirt, while Bob Bartizek works the local in the Gateway Industrial area. The top staging on the right represents Beckley, WV on the C&O while the bottom staging is Williamson, WV on the FPS. Trains off the C&O swap power and cabooses either at Random Yard or at the yard at Flowing Springs before proceeding east on the FPS. 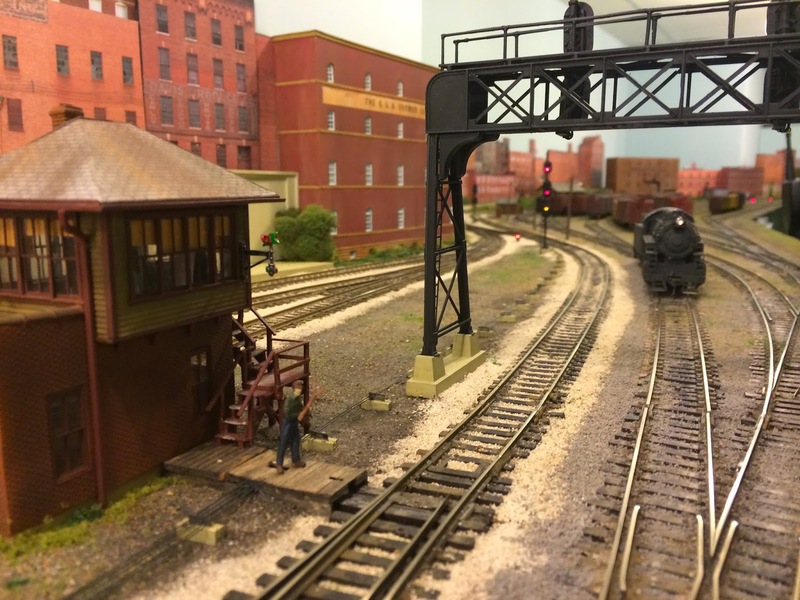 The photo below shows Paul Miklos moving some power out from the house at Flowing Springs for an inbound C&O train. 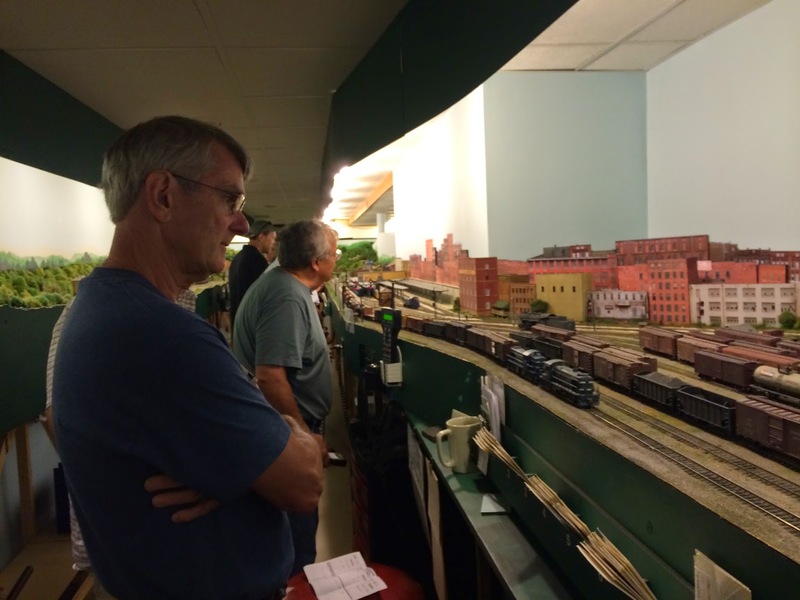 Paul has a triple deck, N-scale layout depicting the B&O from Cincinnati east to Chillicothe, OH that operates using time tables and train orders. The next shot shows Jim Rollwage observing the action at Bedford as George Roos and Anthony Hardy coordinate a meet. In the background, John Miller is taking a quick nap. On the right side of the picture is the passenger station at Flowing Springs and the west end of the yard. The yard at Flowing Springs sees a lot of action during a typical session. In the next shot, Jim Rollwage is getting read to work an FPS freight being brought into the yard by Paul. The yard at Random is used primarily to serve the coal branch that leaves the main at the west end of the yard in addition to the local industries. Stuart Thayer, one of the charter members of the Coal Trucky Hopper Gang, is working the yard in the photo below. On the far left of the photo is Keith VandeStadt who is moving a train through Random on the main. 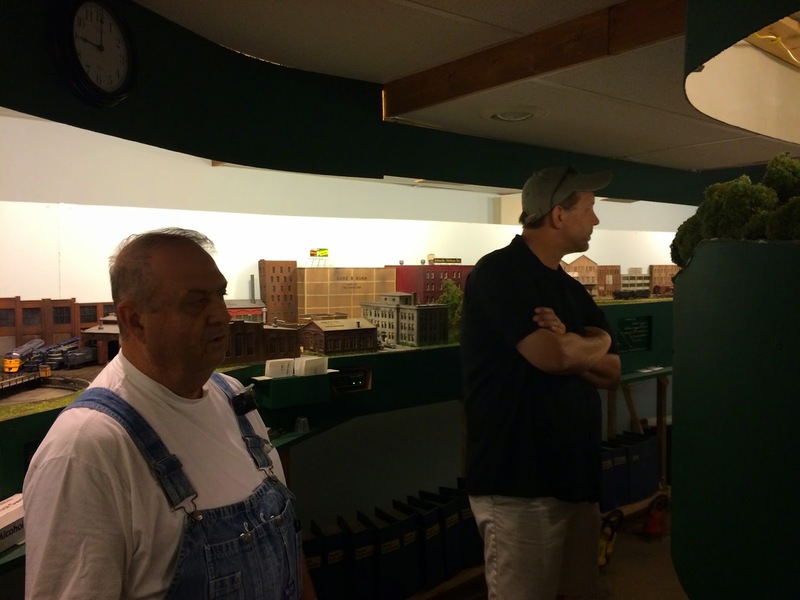 Keith is the creator of the Suffolk Northern, a free-lanced, HO scale coal hauler set in the mid- 1950's. Also working at the yard at Random is Chris Wermuth. 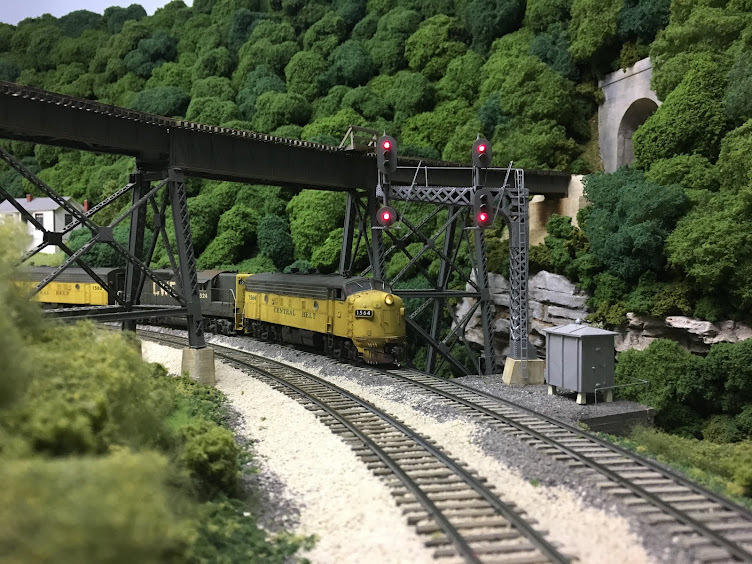 In addition to his usual duties as Yardmaster at Random, Chris designed and implemented the CTC signal system on the layout using JMRI's software. The dispatcher's office's is located in a small room off the crew lounge. In the photo below. 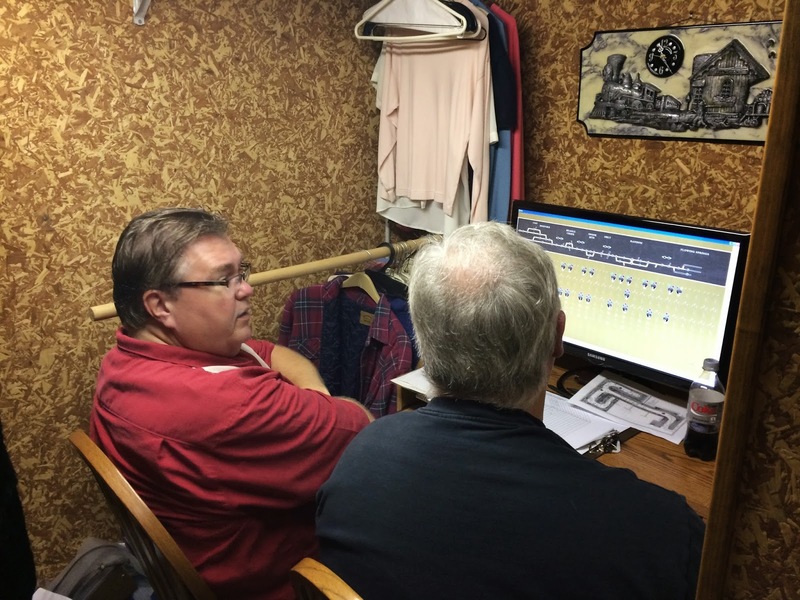 Bob Zoellner (on the left) is keeping a watchful eye on the CTC panel in his usual role as dispatcher on the FPS. Next up we see George Roos (on the left) and Robby Vaughn waiting to take another train over the road. 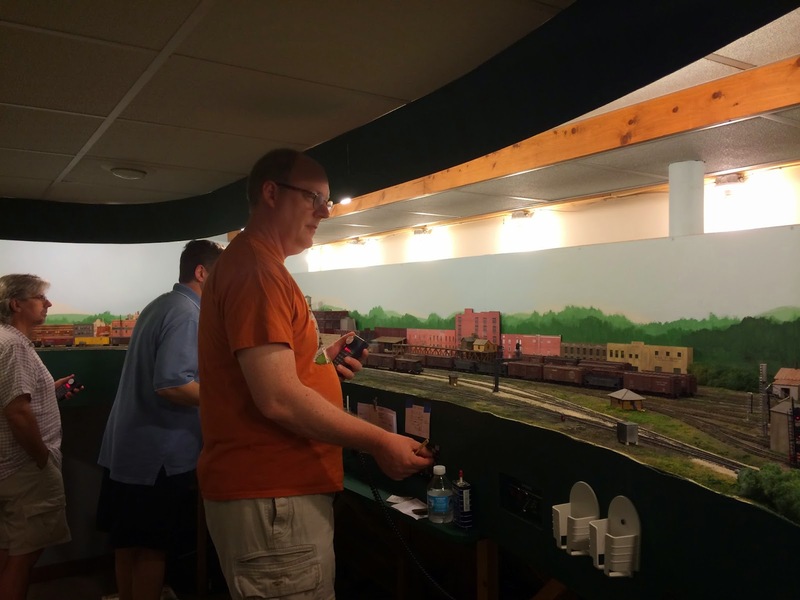 And a post about a session on the FPS wouldn't be complete without some railfan shots. The pictures don't do the layout justice- it really is incredible. Thanks again, Bill, for a great session! 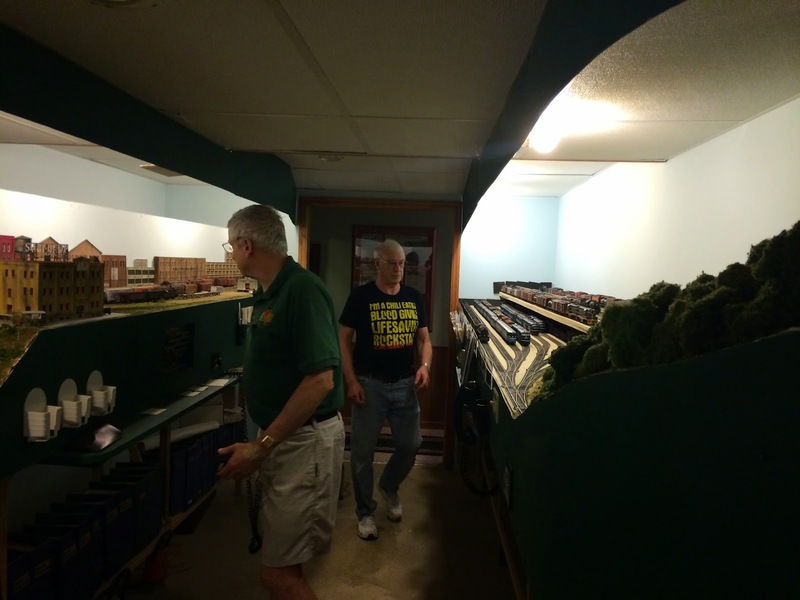 This past week, several friends and I were trading e-mails detailing all of our latest model railroading exploits. While I certainly haven't accomplished as much as they have, I thought I'd post an update to show what's taken place since the tipple at McHenry Coal was rebuilt. Operations on the layout are finally at a point that we're using three of the four tracks in west staging and three of the six tracks in east staging. The remaining three tracks in the east staging yard are shorter than all of the other staging tracks by several feet due to their position on the yard ladder. This is something I've wanted to fix for some time. I remember thinking when I originally built the staging yard that I might have to come back and address the shorter tracks at some point. But once again, it was a case of building something today versus taking a little time to plan first. The photo below shows the extension of the east end of the east staging yard. All of the tracks are at least 15 feet long now and several are considerably longer. One or two of the longer tracks will probably hold a caboose hop in addition to a staged train at some point in the future. In one of the e-mail exchanges, Anthony Hardy asked if the top deck was going to be extended in the same manner. The short answer is yes, and this will potentially provide another six east end staging tracks. But the question started a discussion about how many trains in total the layout will be able to handle during a session. I really have no clue at this point but it will be fun to see how this develops over time. The question also started a discussion about extending a couple of staging tracks along the wall to right in order to accommodate a few more tipples. This is a definite possibility- more to come on that in the future. At the end of the last op session it became apparent that one of the point rails on the turnout between west staging tracks 9 and 10 was misaligned. Since I would have to get all of the tools out to fix it, I decided to go ahead and build the turnouts for tracks 6-8. The photo below shows the progress so far. In what can only be called a blatant act of vandalism, a campfire built and left unattended on the load-out tracks of the McHenry Coal Company tipple at Irma, West Virginia has burned out of control and completely destroyed the mine structure. The building burned throughout the evening of July 19th and by the next morning, nothing was left. The photo below shows the former location of the mine after the company removed all of the debris from the fire. The mine had been loading six to eight cars of coal per day and its loss will have a significant impact on McHenry Coal Company. In a statement issued by the company, officials said they are uncertain whether or not the structure will be replaced. 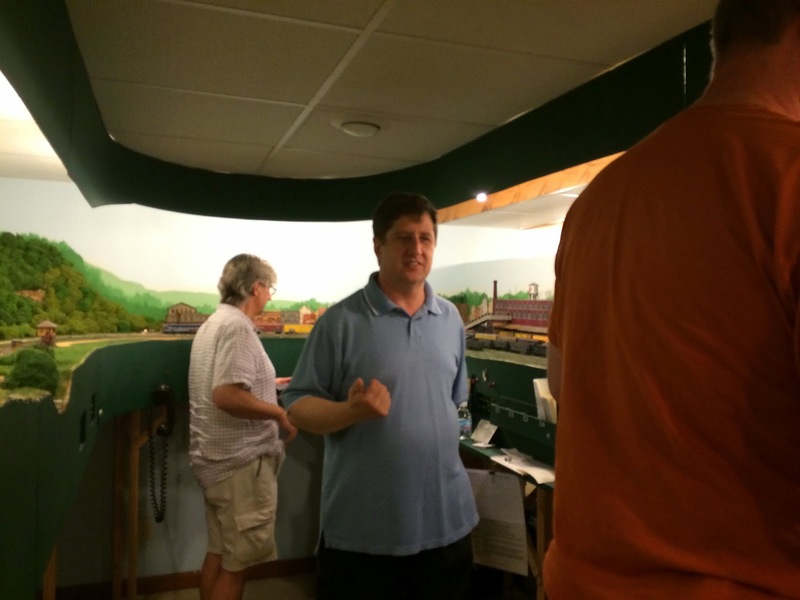 The mine is located at the end of the Sand Fork Branch of the Chesapeake, Wheeling & Erie Railroad. Local authorities are searching for the perpetrators and are confident they will be apprehended. Numerous leads have been received and more are expected in the coming days. The photo below was taken on the afternoon before the fire by local railfans who subsequently gave it to the local sheriff's department. There apparently was nothing amiss when this photo was taken. An anonymous individual sent the photo below to the sheriff's office and it appears to show the perpetrator and the campfire. "This kind of information is extremely important in our search for the vandals, and we're confident they will be apprehended and prosecuted to the fullest extent of the law. The sheriff's office has said that Smokey Doll is a person of interest in this case and they expect to apprehend him for questioning today. He was reportedly in the area at the time of fire and is known to have been associated with numerous other questionable fires in the past. Said an official of the CWE "Smokey would be better served looking for fires on his own property rather than roaming around this neck of the woods." The official was referring to the mysterious fire along the Forest Park Southern that has been burning for almost a month now. About six months ago, I picked up a couple of Athearn Genesis 60' auto parts boxcars decorated for the L&N. These cars came from a collection at Tim's Trains and Hobbies (http://www.timstrainsandhobbies.com/). 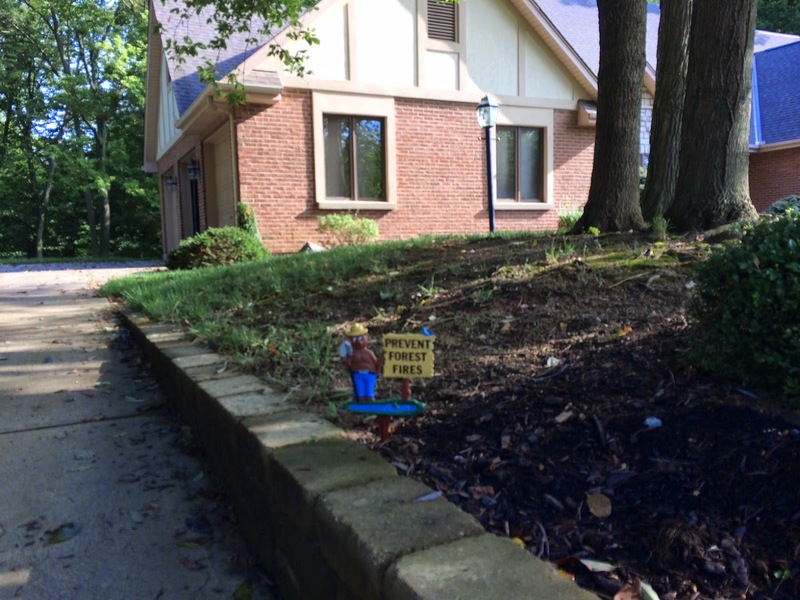 In addition to having one decorated for the L&N, I figured I could strip the other and decorate it for the home road. These are beautiful cars and were in NIB condition. At $15 a piece, I couldn't pass them up. The photo below shows the original car along with the one that I just completed. The first challenge was figuring out how to fade the blue paint. I ended up spraying a number of coats of Floquil Grime that had been thinned to about 30% paint/70% thinner. Once the paint was faded, I applied a coat of Dullcote to seal it. Next, I applied washes of artist's acrylic burnt umber and ivory black. I was stumped for some time as to how to fade the yellow lettering. On this particular paint scheme, the yellow lettering quickly faded to a brownish color and in many cases looked more like ghost lettering that the original paint job. The model sat for some time until one day it occurred to me that a colored pencil might work. After doing some research, I bought a set of Prismacolor Premier water-soluble colored pencils. I drew over the lettering using the dark umber pencil. While I'm satisfied with the results, I think the regular pencils might have worked better for this application. Even though I rubbed the pencil color with my finger once it was applied, there are still more "marks" than I would like. It might be possible to take the end of a tiny stiff brush, slightly dampened with water, to smear the color a little bit to get it blend better. I might try that on the next L&N car in this paint scheme. For the roof, I used artist's acrylic raw sienna and burnt umber and burnt sienna gouache straight from the tube. I started with the raw sienna, applying it with a cosmetic sponge, and the worked in the burnt sienna and burnt umber using both a cosmetic sponge and a stiff bristled brush. Given how fragile these cars are, I'm a little hesitant to try and strip the paint off the second one in order to repaint it for the home road. Perhaps I'll just weather it like this one and add it to the fleet. That would certainly please the L&N fanatics among the regular crew.